Gorilla Glass 6 is specifically engineered to withstand multiple accidental drops. On average, the glass was able to survive 15 lab test drops onto rough surfaces from one meter up — the height at which more than half of drops take place, according to a consumer survey. The same survey suggested that on average, people drop phones seven times a year, which would give Gorilla Glass 6 at least two years of resilience. Corning-developed glass is used in many of today’s mobile devices, and the company debuts new variations every year or two. It formally announced Gorilla Glass 6, a version that’s toplined by improved drop resistance — a feature that is increasingly critical as new devices continue to adopt larger screens and glass backs. According to the company, Gorilla Glass 6 is specifically engineered to withstand multiple accidental drops. On average, the glass was able to survive 15 lab test drops onto rough surfaces from one meter up — the height at which more than half of drops take place, according to a consumer survey. The same survey suggested that on average, people drop phones seven times a year, which would give Gorilla Glass 6 at least two years of resilience. Notably, Gorilla Glass 6 is said to offer up to twice the anti-drop performance of Gorilla Glass 5, and is made from “an entirely new material” that can be chemically strengthened to increase its drop resilience. Corning says that other companies’ soda lime and aluminosilicate glass failed to survive a single drop. In addition to serving as front cover glass, Gorilla Glass 6 can be used as a glass back. Corning notes that it’s optically clear, scratch-resistant, and permits efficient wireless charging, as well as offering touch sensitivity, presumably for rear fingerprint scanning and potentially other applications. It’s worth mentioning that while Corning regularly spotlights improved anti-drop performance in its new Gorilla Glass generations, that’s not always or singularly the case. Earlier generations have promised greater scratch resistance, flexibility, and/or ability to withstand sharp drop impacts, but this version appears to focus almost exclusively on improving multiple-drop survivability. The company also said that the new glass improves resilience to high drops — but offered no details on the height improvements. Corning says that Gorilla Glass 6 is “expected to reach the market in the next several months,” and is currently being evaluated by multiple customers. 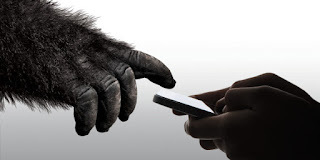 Prior versions of Gorilla Glass have been used in over 6 billion devices from over 45 major brands.